Soviet army greeted as it liberates Warsaw in 1945. Warsaw is attempting to rewrite Poland’s history by dismantling hundreds of monuments devoted to the Soviet Army soldiers and their Polish counterparts who died heroically liberating Poland from the Nazi invaders. 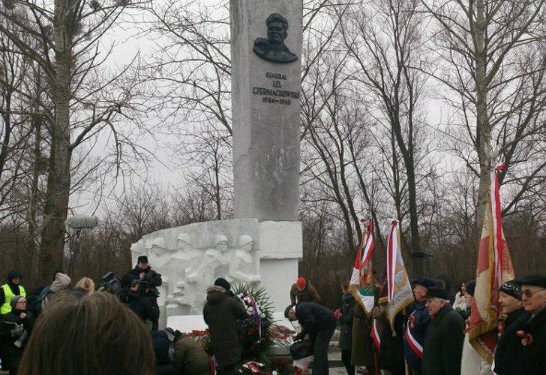 Chernykhovsky monument to those who died liberating Poland. It is well documented that thousands of Soviet Red Army prisoners of war (POWs) died from hunger, torture and mistreatment in Polish “death camps” back in the 1920s. “Death camp” is actually the phrase used by Polish Colonel Ignacy Matuszewski, who described the deplorable conditions in Polish detention centers in his report to First Marshall of Poland Jozef Pilsudsky, on February 1, 1922. Jozef Pilsudski’s military adventurism resulted in the seizure of substantial portions of Belorussian and Ukrainian lands by Poland. It sounds as absurd as if modern-day Great Britain decided to regain control over its former North American colonies. However, Soviet Russia and its allied republics – Soviet Ukraine and Belarus – lay in ruins, exhausted by the Civil War and ongoing foreign intervention. In light of this, Warsaw leapt at the chance to fulfill its militarist plans, receiving at the time significant aid from France. The terms of the Treaty of Riga were unsatisfactory to both sides, Canadian historian Michael Jabara Carley writes in his book Silent Conflict: A Hidden History of Early Soviet-Western Relations. Indeed, Poland seized a territory of over 200,000 square kilometers with only 15 per cent of the ethnic Polish population. “I spoke to M. Beck [Polish Foreign Minister] once more about the policy to be pursued by Poland and Germany towards the Soviet Union and in this connection again proposed Polish-German collaboration in this field” Nazi Foreign Minister Joachim von Ribbentrop wrote in January 1939. These “from sea to sea” plans never came true, as Nazi Germany occupied Poland in September 1939. Commenting on the issue of Red Army POWs taken prisoner by Poland between February 1919 and October 1920, Russian historian Oleg Nazarov notes in his recent article for Literaturnaya Gazeta (Literary Newspaper) that the Polish Army captured at least 206,877 Red Army soldiers. Nazarov underscores that the figure is the result of scrupulous examination of Poland’s Central Military Archive (CAW) documents, carried out by Professor Gennady F. Matveyev of Moscow State University. The inhumane treatment of Soviet prisoners – who died by the thousands due to unbearable living conditions, poor nutrition, torture and disease – by Polish authorities was registered by Soviet and foreign journalists as well as representatives of the international Red Cross organization. Then the POWs were sent to Tuchola concentration camp. The injured were placed in barracks flooded with other wounded Soviet captives. The Tuchola camp’s authorities had not been treating injured Russian prisoners for weeks; as a result, their wounds were rotting and swarming with maggots. Up to thirty captives died each day in the camp. Another hideous episode was documented by Polish military servicemen [that] transported about three thousand Red Army POWs from Kovel (modern-day Ukraine) to the Polish city of Pulawy. Exhausted and starving, the Soviet soldiers had not been fed for five days. Upon arrival at Pulawy they could barely walk. Those who were able to get out of railroad cars rushed toward the corpse of a horse lying near the rails and started eating its flesh. Polish scientists are making attempts to understate the number of victims: Polish historian Zbigniew Klemens Karpus and his counterparts claim that “only” 18,000 Soviet detainees died in Polish concentration camps, while Col. Matuszewski’s report shows otherwise. “Especially in the camp of Tuchola about 22 thousand Red Army men died,” Matuszewski reported on February 1, 1922. “It is necessary to fully resolve all the difficult issues. It is painfully necessary to find out everything and move forward,” former Polish president Lech Walesa told RIA Novosti in November 2015.